(B) I’ve got a dear friend – Rosemarie Rossetti – who 20 years ago was crushed (and her back cracked) when a 3-ton tree fell on her on a summer bike ride through the park with her husband. Now Rosemarie needs to use a wheelchair. This has not stopped her from speaking to groups and helping others triumph over tragedy and learn about universal design, however. (C) I’m a weird needle in a haystack (I know some of you are nodding your head right now). By that I mean I’m CAPS certified (this stands for Certified Aging in Place Specialist through the National Association of Home Builders) who has been trained to help people design spaces for the aging process. In addition, I’m also a closet designer. There are not many CAPS certified closet designers. 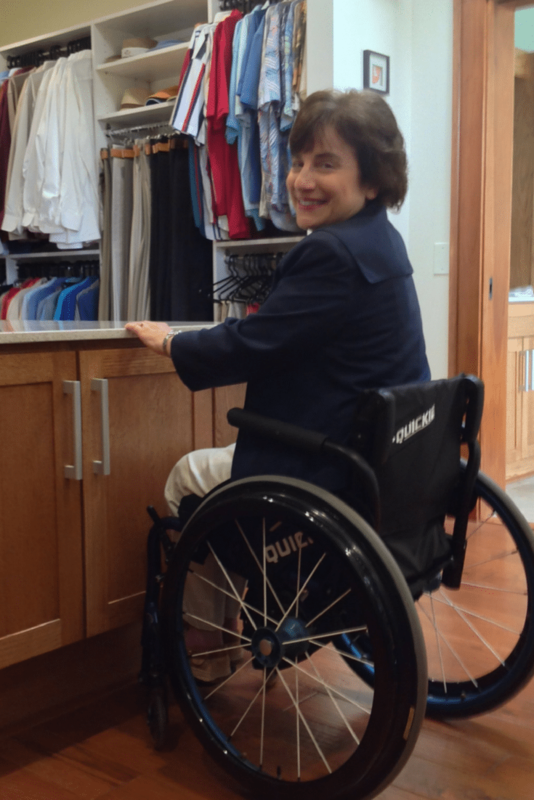 What I do know about closets is they are already a DISASTER area for people who don’t have mobility challenges. Then, lay over the top the need to access your closet in a wheelchair or walker – and you have a doubly difficult design task on your hands. The harsh reality is even if you aren’t in an accident like my friend Rosemarie, our bodies are, unfortunately, a bunch of ‘wear-parts’ which go South as evil “Father-Time” descends upon us. Having a closet which is easy to use – no matter what your mobility is like today or tomorrow – is smart. 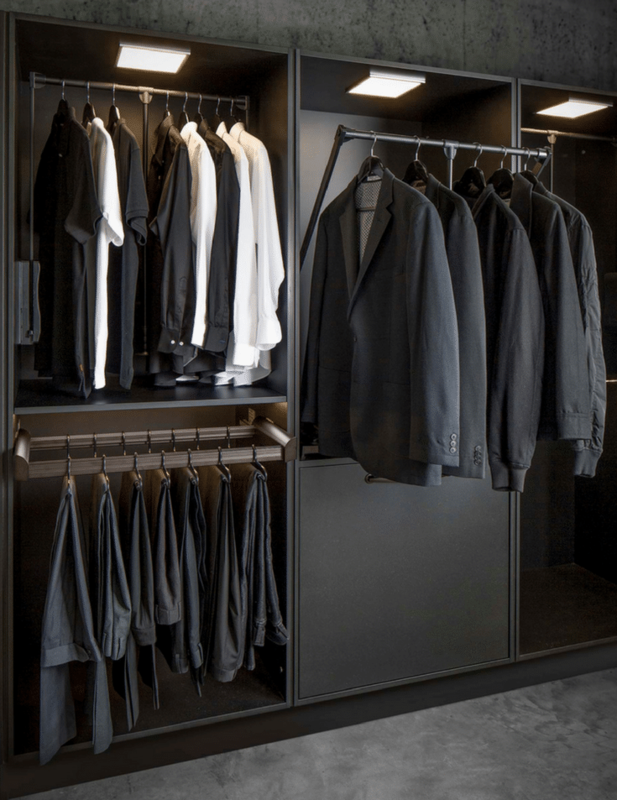 It’s even better knowing a closet designed around universal and accessible design principles can be stylish. 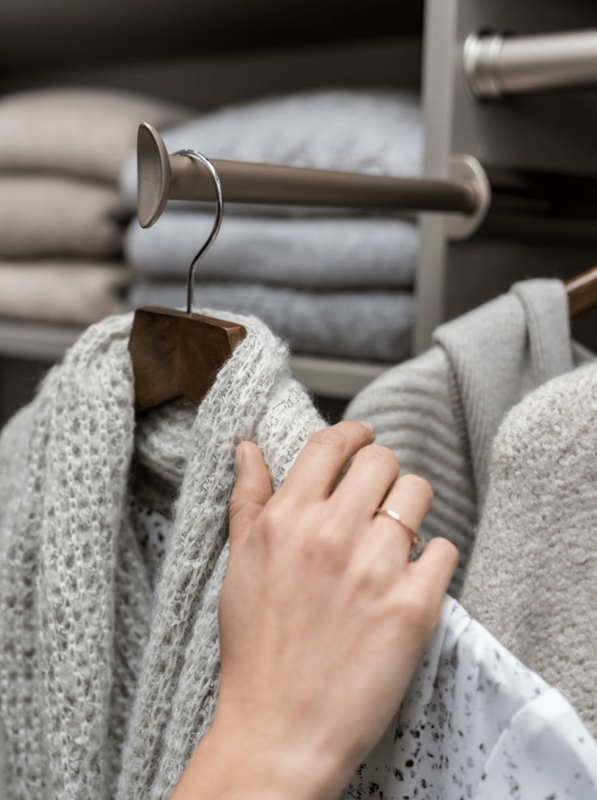 In this article my goal is to present 9 simple ideas along with the help of some very bright friends (Rosemarie Rossetti and Denise Butchko) to create a stylish, yet accessible closet. At the end I’d love to hear which ideas helped you, other smart ideas you’ve used, and questions you have. In most new-home-builder supplied closets, the standard height of a single rod can range between 60” to 72” above the floor. If you’re in a wheelchair and need to reach clothes on the top rod, using a garment or Shepard’s hook puts stress on your shoulders and can be a pain in the neck (literally). There are better ways someone with mobility challenges can hang clothes. One simple idea – use 2 closet rods (an upper and lower one) and position the lower rod 30” off the ground. This will be easy for someone in a wheelchair to get blouses, shirts, pants and jeans without straining. For higher hanging garments (i.e. long dresses or suit jackets), a pull down closet rod will bring your clothes to you. This is one feature Rosemarie wishes she had in her universal closet. Most closets are not what I call ‘fully functioning.’ This means you can’t get completely ready in them because there is no place to retrieve small things you need to complete your outfit. Think socks, pantyhose, underwear, ties and jewelry. This is where closet drawers come in handy. 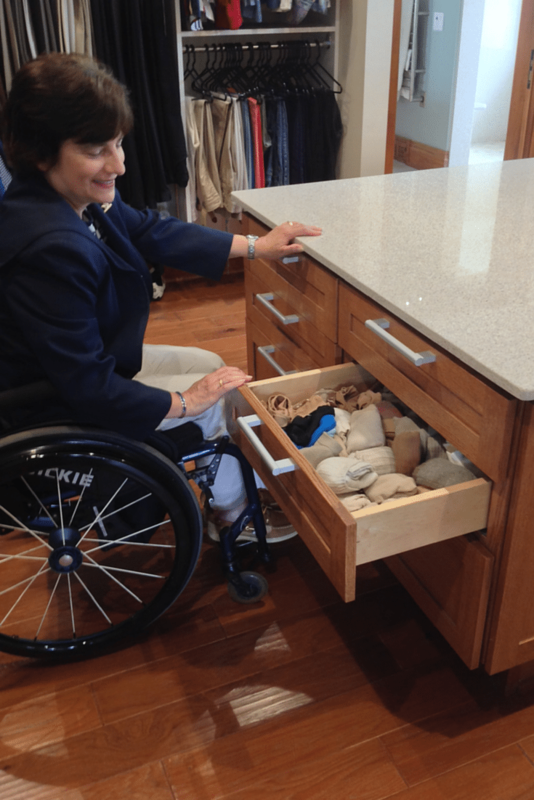 However, if you’re in a wheelchair the placement and size of drawers needs to be carefully designed so they aren’t too high (where you can’t see over the top of the drawer), or too low (where it’s a strain on your back to bend over to pull things out). With these challenges in mind (and because there are usually only limited places to put drawers, so they can fully extend) I recommend in an accessible closet to use wider drawers. In addition, only design them up to 33” off the ground (allowing an inch above for a top). Start drawers approximately 8” off the floor – if bending over is difficult. 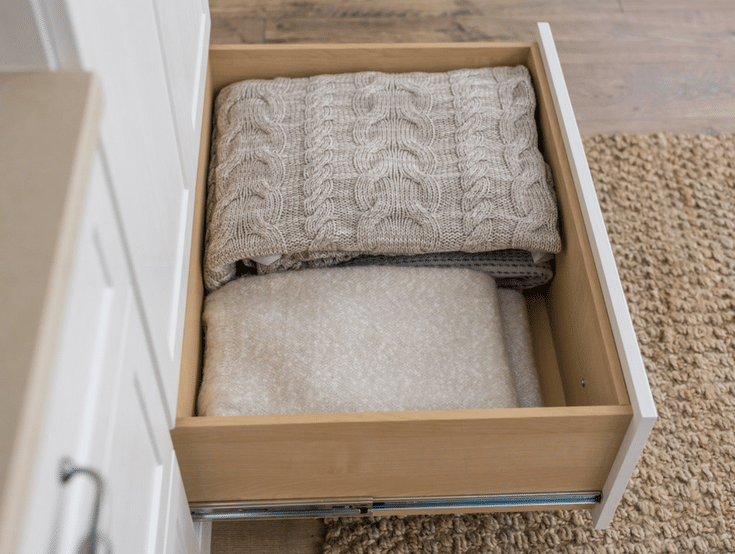 An effective drawer design will allow you to have a closet which is ‘fully functioning.’ You won’t wake up your partner turning on the lights and using bedroom dresser drawers during the morning rush. 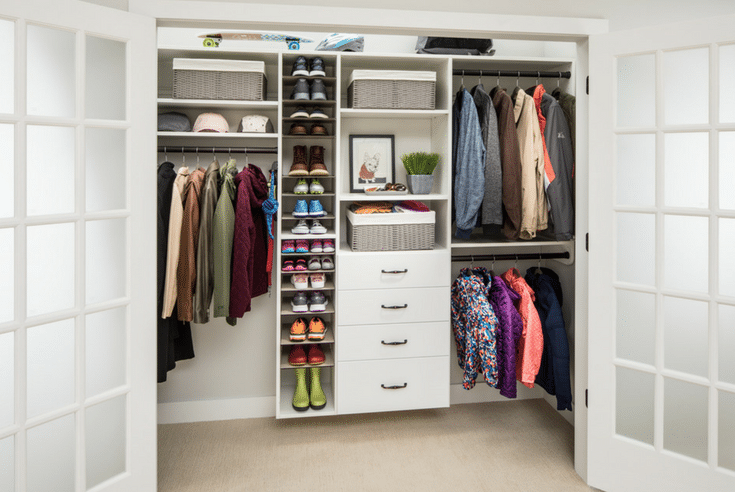 If you’ve been reading along at home, you may remember I wrote an article last year on how to ‘win the battle’ of the his and hers closet and prevent storage wars (that article is Storage Wars: 7 Essential Tips to Win the Battle of a His and Hers Closet). I didn’t want you to end up on the latest episode of Cops fighting over your closet. 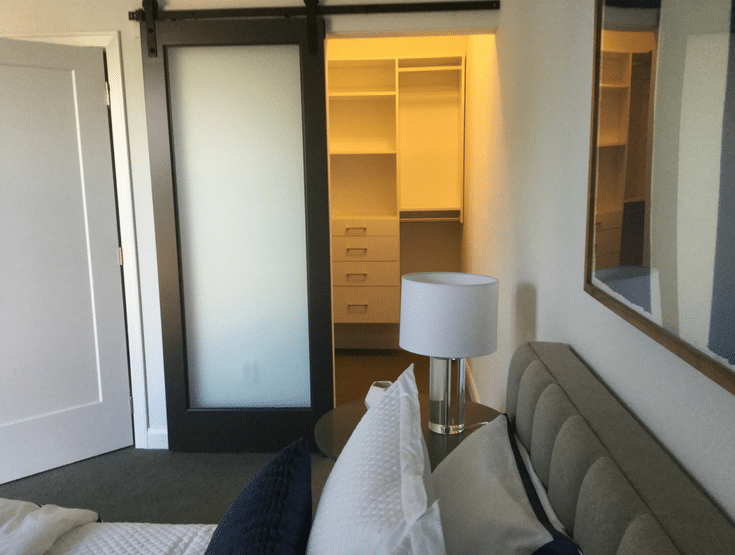 In this article I recommended the ‘traditional’ way to split a closet to create personal zones using a vertical ‘Mason/Dixon’ closet dividing line. When both you and your partner are fully mobile this strategy is sound. When one person’s mobility is challenged, this strategy is flawed. If your closet needs to be more accessible, I would turn this logic 90 degrees and split your closet space horizontally. The person in the wheelchair, walker (or the one who is small in height), gets the bottom. The person without the mobility challenge gets the top. One note of design caution. Make sure you don’t design upper level hanging space over the lower level shelving or drawer spaces. Otherwise it’s difficult for the person using the bottom to see what they’ve got on shelves or in drawers. Back in my college days at Carnegie-Mellon University, I actually understood ‘fancy-pants’ (no closet pun intended) psychology terms like cognitive dissonance, psychoanalysis and self-actualization. Today – I’m not nearly so deep, but I am more practical (it’s amazing what a wife and 3 kids will do to you!). 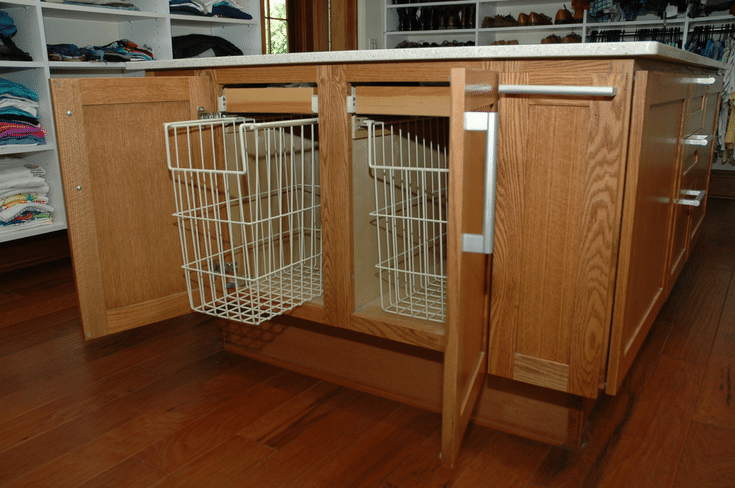 (1) Replace 12” deep wire shelves with 19” to 24” deep slide out shelves. This depth will make it possible to get 2x the number of stacks of clothes or shoes (depending on length) in the same area. You’ll double your pleasure and double your storage fun (can storage actually be fun?)! (2) Instead of using standard 12-14” deep drawer boxes, move up to 18” to 22” depths. Once again this will put more storage volume lower and accessible to you. Plus, you can get 2x the storage in a drawer than with clothes on hangers. When you’re building new it’s a golden opportunity to make the entrance to your closet simple, without modifications needed down the road. One possibility is to use a sliding barn door or a pocket door. Barn doors today are hot– and they make sense in an accessible closet because they won’t get in the way. If you don’t have the wall space for a barn door to slide over, and a pocket door isn’t practical, the next best thing is to swing the door out. If the door needs to swing in use a 32” to 36” unit so it is wide enough for a chair or walker. With an in-swing door make sure to use thinner storage sections behind the door – like shelving – so your door isn’t pushing into your hanging clothes or banging a drawer which will pull out. Altering the size of a door opening in remodeling can be complicated (and expensive). While this is certainly an option, the cheapest way to solve an inswing door challenge for an accessible closet is to blow the door up all together (i.e. get rid of it). In place of the door put in stylish curtains – so you don’t have to worry about having the perfect “Khloe Kardashian” closet all the time. Most people don’t know there are 2 basic types of closet systems. One is a ‘wall hung system’ where closet support sections on placed onto a support rail. This system does not go to the floor. The second type of closet system is a ‘floor based’ closet where the support sections go to the ground and there is either a toe kick or baseboard trim at the bottom. Each of these systems has its strengths and weaknesses (note: you can learn more about them in by reading How to choose between a wall hung or floor mounted closet organizer). For an accessible closet, a wall hung system is super-easy for someone in a wheelchair because you can roll up to your clothes, drawers and shelves without bumping your feet on a toe kick or baseboard below. The negative is, you’re limited to 14” deep shelves and drawers. With the standard floor-based system, the good thing is you can use deeper drawers and shelves (see some advantages in idea 4 above), but the standard toe kicks are only 4” tall and not very deep. If you’re designing for a wheelchair move these kicks up to 8” tall and 6” deep so, you’ll get the best of both worlds (deeper drawers and shelves without a hassle of running into the toe kick). 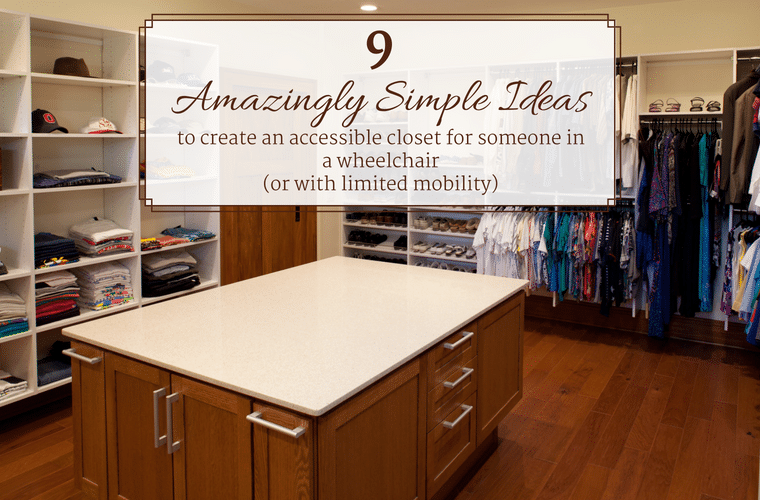 Accessible closet idea #7 – Simple is good! If you’re a fan of the movie Wall Street (and the financial geek in me just loves movies like this) you’ll remember the line Greed is good. In closet design, its simplicity which is good. An effective design doesn’t require work. Your clothes, accessories and shoes come to you vs. you struggling towards them. Some cool ways to add functionality (and simplicity) are to use the closet version of a ‘lazy Susan’ in the corner of your design. This way your shoes and jewelry can spin around to you. Another way to get things to come to you is with pull out and pop out accessories. Tie racks, belt racks, wardrobe rods and scarf racks are designed to move out towards you – making it simpler to get what you want and need. Rosemarie just loves the valet rods which allow her and Mark to stage clothes for upcoming trips or tomorrow’s meeting. In addition, her pull out hamper is ultra-convenient. Accessible closet idea #8 – A glamorous closet island is only glamorous if it works! If you’ve got a large space for your closet – congrats to you. 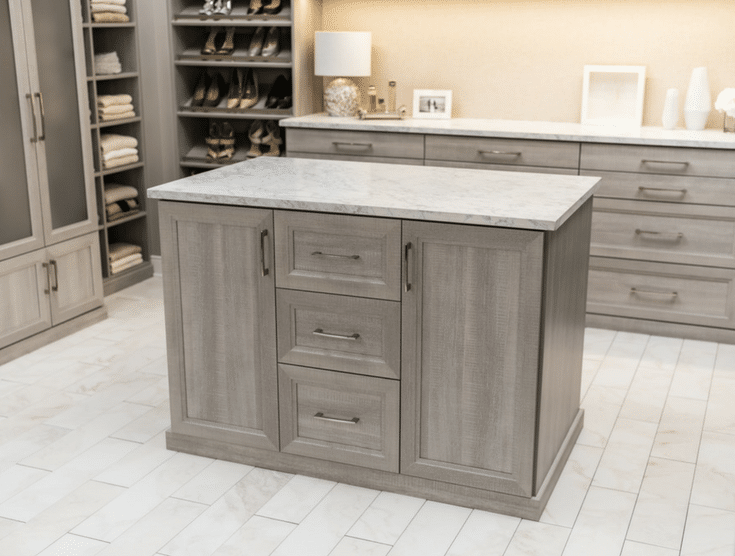 You may have an opportunity to use a closet island to add style and increased function. Islands are convenient places to set out clothes, add more drawers and shelves. However, with they can be a bad feature if it’s not designed right. For an accessible closet you’ll need to allocate 3’ around the island to roll around. In addition, make sure the height of the countertop does not exceed 34” so someone in a wheelchair can use the top. In addition, as Denise told me, closet islands and countertops can serve ‘double duty’ to provide support for someone who is not steady on their feet (kind of like horizontal grab bars). For more closet island design ideas read 6 Awesome Tips for a Custom Walk in Closet Island. Whether you like it or not, your closet and laundry (sorry to bring up that dirty subject – pun intended) are joined at the hip. Unfortunately, those doggone clothes don’t magically wash, fold and iron themselves. One trend I’m noticing lately (which makes a ton of sense in my book) is to combine your laundry inside your master closet (or put it in close proximity). If you want to put your laundry in one big room with your closet (which my friend Rosemarie did) check out the tips in the following article (5 Essential Tips for a Universal Design Laundry Room) . I love how she strategically hinged the washer and dryer to make clothes transfers simple. In addition, she installed a fold down ironing board and used so much natural light it takes (a bit) of the laundry drudgery away. While it may not be ‘fun’ to think about needing an ‘accessible anything,’ in a new or remodeled home, it’s important (and cost-effective) to design spaces so you can live independently as long as possible. Which of the 9 accessible closet ideas above will be helpful to you? Do you have any other ideas to add which will help others? How can I, my team, Rosemarie or Denise help you with custom (or accessible) closet organization system? 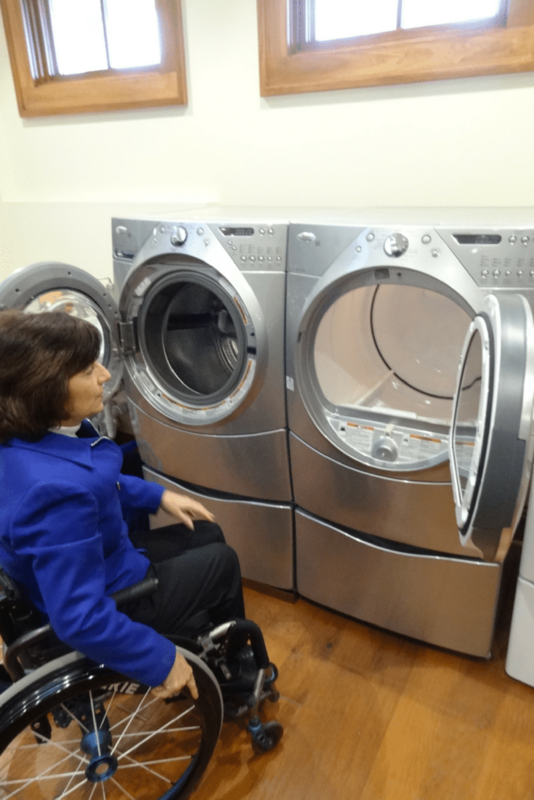 If you’d like to learn how to create a functional, fashionable accessible closet and get a Free 3D design contact Innovate Home Org in Columbus at 614-545-6888 or in Cleveland at 216-658-1290. If you’d like to learn more about universal design call Rosemarie Rossetti at 614-471-6100 or visit her site http://www.udll.com.